Its every kids desire to get behind the wheel of there very own car, and at the Tomorrowland Indy Speedway, they can do just that! 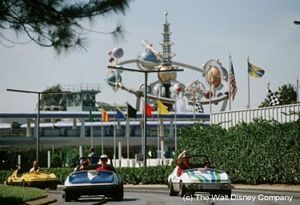 The elaborate miniature raceway sits between Tomorrowland and Fantasyland and features gas-powered cars which you control, along a long and winding track. Sounds from the raceway can be heard as you progress round the track and the checkered flag awaits all who cross the finish line. Although it may be aimed at the younger generations, there are plenty of big kids joining in on the fun, too! If you don't want to take the wheel of a race-car, take a seat in the grandstand to watch family or friends. Lines can be quite long and mostly in unshaded areas, bottled water is often a good thing to have near at hand. For a shorter wait, turn right once you cross the pedestrian bridge rather than continue to the second turn. Be wary or other drivers, the cars run along a guiding track and can be quite difficult to steer so its not uncommon to be bumped by those less experienced behind the wheel. When you remove your foot from the accelerator the car will slow to a stop. The Indy Speedway was one of the original attractions to ride on the Magic Kingdom's opening day back in 1971. Al Unserbot is the official host of the Tomorrowland Cindy 500. In all, there are 146 cars that run around the track, which itself is almost half a mile long. The speedway cars can reach a top speed of 7mph. Did you know that a checkered flag is waved at every driver who finishes at the end of the race? Frequently the flag is given to the winning driver as a memento. Guests must be able to transfer from wheelchairs to board the attraction. 54" height restriction to ride alone. Guests not meeting the required height restriction can ride alongside someone who does. Guests should be in good health and free from motion sickness, back or neck problems, heart problems, or other conditions that could be aggravated by this adventure.